I can't seem to get a definitive answer from the android design guidelines page. If the preferred behavior is to swipe through tabs then this page will need to be re-designed. The design of your application is similar to the previous implementation of "Pulse News" (Android). They used tap instead of swipe to avoid accidental context switch. I'd say to use taps on the tab. To me, it's more intuitive because I would think to tap on that thing if I wanted to go there. Swiping is more work that necessary to get the same effect, and can actually confuse the user. This can deliver a double functionality, too, because you could optionally give the functionality to swipe the tabs bar like your feeds if you had more than three visible tabs. I would obviously expect the tabs to work on clicks also... loads of work to make it seem simple eh? Do some reaserch and consider which content will be more interesting for your potential users, and where/when they want to use swipe gesture more often. It really depends on content which will be in this tabs. If you do not need big pictures, long description etc. 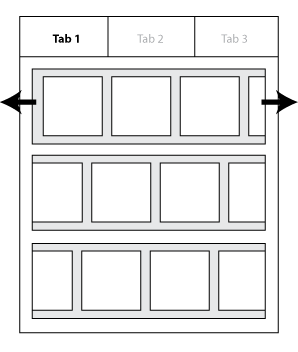 then option with swipe insert single tab will be just fine. Scrolable Tabs or Navigation Drawer for navigation in Android app?